VEDA designed a new vehicle impact barrier along station road in Stainforth. The requirement was to provide a system for the southern approach and northern exit of overbridge DOW 14 spanning over running lines the vehicle restraint systems was installed at the crest of the embankments to mitigate against vehicles accessing Network Rail infrastructure. Structure DOW-14 is a three deck span overbridge with masonry bridge parapets. 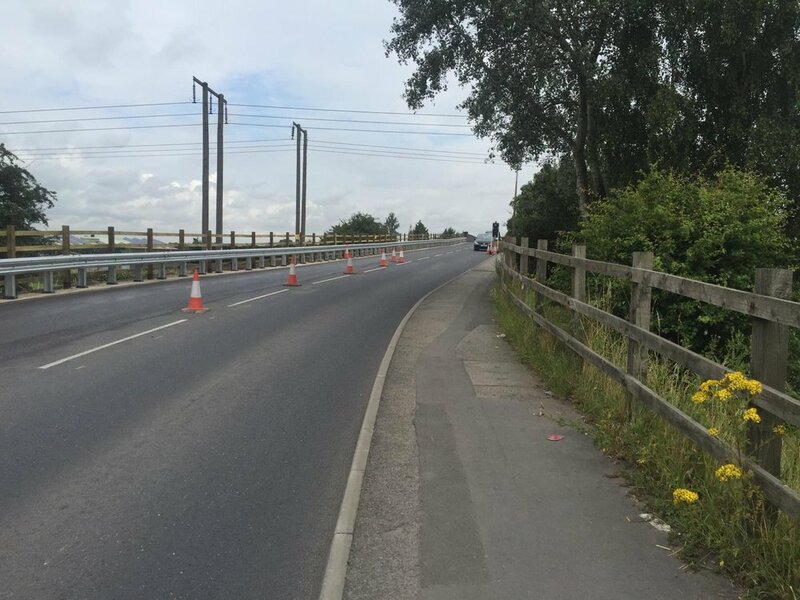 The existing barrier on the approach to the bridge consisted of a timber post and rail fencing, which, based on RT/LS/G/0012 Road Vehicle Incursions: Risk Assessment of Bridge and Neighbouring Sites, produced a risk score of 90. It was therefore necessary to design a barrier system to reduce the overall risk score. In order to lower the risk score of the road to below 70, the proposal was to remove this fencing and install a vehicle restraint system to the west side of the bridge (left hand carriageway) on both the southern approach and northern exit. The requirement was to install a metal barrier with a containment level N2, working width class of W1 and impact severity level B. As specified by EN 1317 Compliant Road Restraint Systems, the only suitable barrier was a Hill and Smith Flex-Beam PLUS Single Sided Corrugated Beam VRS system. Based on the working width class W1, in order to provide sufficient working width of 0.6m for the barrier, the top of the embankment had to be widened by 1m for the southern approach to the overbridge. Strengthening works had already been carried out on the northern exit of the overbridge, which meant the required working width had already been provided. Initially a geotechnical investigation was carried out on the embankment to facilitate for the design of the posts. This proved that the embankment core was formed of a weak sandy material unlikely to allow a driven post solution to work. The proposal was to install the Flex Beam Plus on Z posts. Typically an in situ test is normally conducted to determine if a foundation is required, however due to the proposed location of the restraint barrier an in-situ test could not be conducted prior to the embankment crest being widened. Once the embankment widening had been implemented, a push load test was carried out proving failure of the soil. Therefore the Flex Beam Plus post were cast into a strip footing at the crest of the slope. With some on-site liaison, the barrier was installed successfully.